The nearly 30-building West 2nd District will also provide market-rate and workforce housing, with 20% of rental units available as affordable housing. Architect and developer Don J Clark Group and landscape architects Office of Cheryl Barton (OCB) are currently at work on the initial phases of the world’s first high desert biome eco-district, West 2nd District, a new $1.2 billion purpose-built neighborhood in the heart of downtown Reno, Nevada. The project proposes taking over a series of underutilized lots in order to jumpstart an ecologically driven neighborhood containing 1,900 housing units, 450,000 square feet of office space, and 250,000 square feet of retail space. The nearly 30-building district will provide needed market-rate and workforce housing as well, with 20 percent of rental units available as affordable housing for those who qualify. 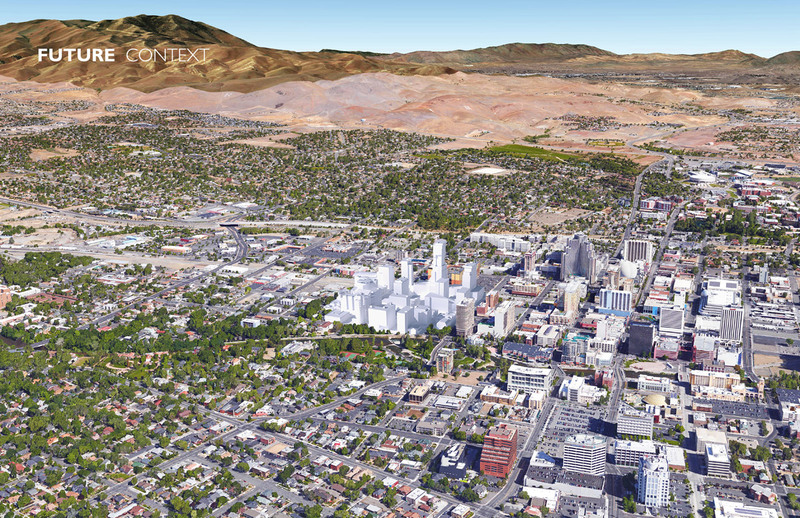 One hope is that the West 2nd District can feed Reno’s booming technology industry. Reno is affordable—and a 45-minute flight from Silicon Valley—so it is absorbing regional economic and population growth. Tesla operates its Gigafactory in Sparks, Nevada, just outside Reno, and Apple operates cloud-computing servers in the area as well. Stanford University, ZGF Architects, and landscape architects Office of Cheryl Barton (OCB) will soon break ground on the 35-acre Redwood City Campus, the first off-campus expansion for the Northern California-based university. 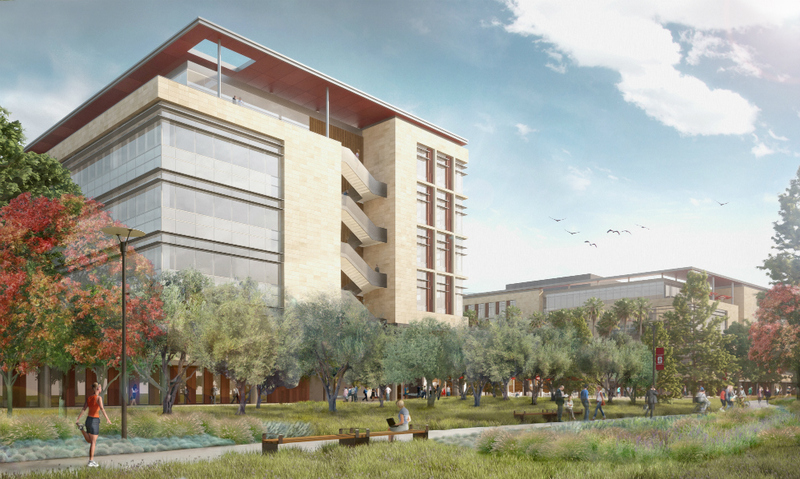 The campus will be located about seven miles from Stanford’s flagship site and will eventually contain roughly 1.5 million square feet of office space, medical clinics, and research and development facilities. The University, according to an official website, aims to build up to 13 new structures housing up to 2,400 employees over the next few years. The project would both consolidate an existing constellation of satellite facilities and add new spaces and programs, as well. The overall scheme is being developed through a master plan approach via a document called the “Stanford in Redwood City Precise Plan.” The document outlines urban guidelines for the multi-block site, including regulations regarding general massing, scale, materiality, and maximum building heights. The plan relies on this set of rules, including maximum block-specific Floor-to-Area Ratios (FAR), to maximize the amount of planted, open spaces and pedestrian paths along the ground. The designers are hoping to create an even, contextual density. Furthermore, the plan aims to surround these open spaces with a highly-curated set of building types articulated in a variety of architectural styles. The project does not include a housing development component. Instead, the campus will primarily house non-academic university functions and offices, including spaces for the University’s Business Affairs and Human Resources office and Stanford University Libraries, among others. Phase I of the project—due to break ground May 17—will include 580,000 square feet of office space across four office buildings and will also include three amenity structures, two support services buildings, and a parking structure. The scheme is configured around a central greenway and contains 2.4 acres of public open space overall, including an oak tree-shaded transit plaza located at the center of the campus. OCB’s landscape design, which has to contend with a highly-compacted site containing alkaline soils and a high water table, is also rather water-savvy. The green areas within the project have been designed to collect and store rainwater and will make wide use of bioretention gardens that filter and hold runoff before ultimately allowing it to empty into the San Francisco Bay. The project’s open areas will also be irrigated with reclaimed water, which is typically more acidic than traditional water. In response, OCB has partnered with horticulturist Nelda Matheny to develop an “adaptive landscape” that can tolerate the area’s existing soils and survive the heavy use of reclaimed water. In a press release for the project, Cheryl Barton, principal at OCB said, “As the first major new construction project of this scale to adhere to current state legislation regarding the use of reclaimed water, the project presented an opportunity to leverage significant site constraints to embody the Stanford community ethos and create an extraordinary open campus workplace situated on a highly adaptive and resilient site primed for climate change.” The project team is aiming to complete phase I of the project by 2019.